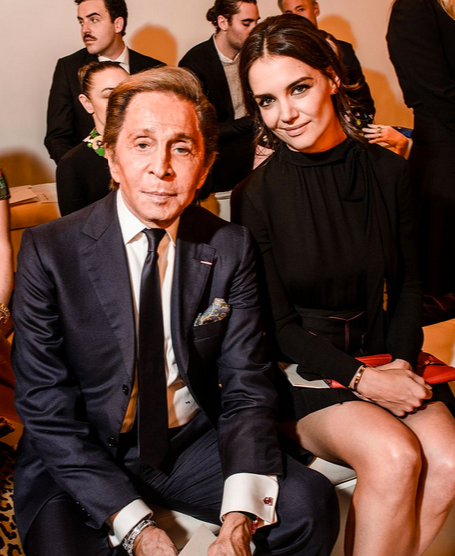 It’s been a banner year for Valentino. There were the usual highlights, of course—lauded new ready-to-wear collections, Keira Knightley showing off her baby bump in floral-embroidered Valentino at the Oscars, Nicky Hilton and Beatrice Borromeo walking down the aisle in Valentino Haute Couture gowns. Lovely moments all, but par for the Valentino course, you might say. Naturally, Mr. Giammetti and Mr. Valentino took in the Sala Bianca 945 looks from the front row, and one of the celebrities accompanying them was Ben Stiller, in an appearance that raised a few fashion industry eyebrows. Those eyebrows—and many, many, many more—shot even farther skyward when Valentino pulled off the greatest stunt casting coup of all time at the house’s Ready-to-Wear show in Paris in February. Stiller emerged on the runway, in character as Derek Zoolander, joined by Owen Wilson in character as Zoolander’s male model nemesis, Hansel. Was their side-by-side strut down the catwalk being shot for the forthcoming Zoolander 2? Only time will tell. But audience members gleefully snapped pics of the Valentino-clad duo, and those images instantly zoomed all over the globe. Meanwhile, back in New York, the new Valentino flagship opened for business, and the Council of Fashion Designers of America voted to give the 2015 International Award to Grazia Chiuri and Piccioli. In June, fellow Italians Franca Sozzani and Valeria Golino ascended the stage at the CFDA gala to present Grazia Chiuri and Piccioli with their award. The celebration continued the following month in Rome, as Valentino returned home to stage an alfresco Fall/Winter 2015 Haute Couture show. The collection was called “Mirabilia Romae,” which translates from the Latin as “Marvels of Rome,” and it evoked various epochs of the Eternal City, from the era of emperors and gladiators to the midcentury heyday of filmmakers Fellini and Antonioni. Artist Pietro Ruffo provided the set, a modern take on the Roman Forum. But the haute couture show wasn’t the only event on the schedule for the celebrities and fashion industry VIPs who made the trip to Rome: Highlights also included the Mostra Diffusa, or “diffused exhibition,” which featured Valentino couture looks installed in secret locations all around town, and a lantern-lit dinner outdoors at the 17th Century Villa Aurelia. And there was another must-see, too: The new Valentino flagship in Rome’s Piazza Mignanelli, which, at 20,000 square feet, is the largest Valentino store in the world. A new landmark, for a landmark year.